As you age, you may begin to notice lines or wrinkles across your brow and forehead. This can give you an older or even angry look, since we often use our brows to express emotion. 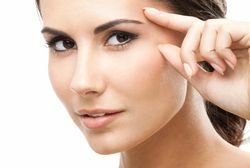 To help rejuvenate your face and restore a calm, happy appearance, Dr. Stephen Eric Metzinger performs brow lift surgery at his Metairie, LA practice. Dr. Metzinger uses breakthrough techniques that lead to great patient outcomes. We also provide different types of brow lifts to suit each patient’s needs and wishes. To learn more about our brow lift options or schedule a consultation with Dr. Metzinger, please contact us today. Dr. Metzinger will conduct an exam and go over your medical history to determine if you are eligible for a brow lift. Endoscopic: During this procedure, Dr. Metzinger will make small incisions around your scalp, through which he will insert a computer-controlled viewing device called an endoscope, as well as surgical instruments to modify your facial tissue. He often uses Endotine® technology during an endoscopic brow lift. The Endotine® device is a small, biocompatible piece of plastic that holds the brow in proper place and gradually dissolves over the next six months as the tissue heals. The effects of a minimally invasive endoscopic brow lift can last for seven years or more. Trichophytic: This type of brow lift involves a modified coronal incision. Rather than a straight line, Dr. Metzinger will make a wavy incision along the hairline, pulling excess skin and tissue from the forehead rather than the hair-bearing skin. Many patients appreciate this surgical technique because it does not raise the hairline, and provides long-lasting results. ​​​​​​​Lateral (Mini). If you have mild to moderate sagging or wrinkling in your brow, Dr. Metzinger can perform a lateral, or mini, brow lift, making a shorter incision across your forehead to more subtly lift your skin and balance your facial proportions. During your consultation, Dr. Metzinger will discuss the benefits and disadvantages of each technique with you so you can decide which you would like to pursue. A brow lift can give your face a more symmetrical, tranquil, and youthful appearance. Dr. Metzinger uses some of the latest techniques to provide excellent results with minimal scarring. Contact our practice today to learn more about these procedures or schedule a consultation.